While I'm not much of a joiner, I have for some time been considering becoming part of two reviled subcultures - one is the NRA, because I frankly find their right-wing paranoiac worldview closer to my own left-wing paranoiac world-view than most of the crème filling in-between. The other is cigarette smokers. The last bastions of democratic phallic exhibitionism (aside from King Kans of malt liquor, with which I am perhaps too well acquainted), guns and smokes interest me mostly for the insane levels of organized disapprobation they elicit — a sure sign in this culture that something fun is going on; i.e., good, but not good for you. The volume of protest about both — but cigarettes in particular — also suggests that this debate concerns not only healthy living and informed decision-making but an unusually potent bundle of cultural symbols, and the question of who gets to wield them. The excesses of the tobacco industry are well-documented but in effect no different from many other corporate capitalist strategies. It seems unlikely that anyone really still believes that SONY or Nike or America Online would refrain from loading us all into boxcars if we came between them and their quarterly profits. Can we say Bhopal? Exploitation, bullying, deceit, and murder are big business as usual, even if they are treated in anti-smoking literature as if they are simply the causally related effects of nicotine. Indeed, the virulence of anti-tobacco condemnation is not derived from outrage over economically driven social injustices, as may be supposed, but from the entirely separate and unrelated fact that the product in this case has been equated in the popular imagination with disease and death, and official culture guards the administration of these domains very jealously. If Joe Citizen is able to buy death, handle it, mete it out, own and control it, then how can the government threaten him if he fails to show up for work? Confiscate his cigarettes? It's no coincidence that the internal economy of the prison system — the New American Social Contract in its purest state — uses the cigarette as its basic monetary unit. 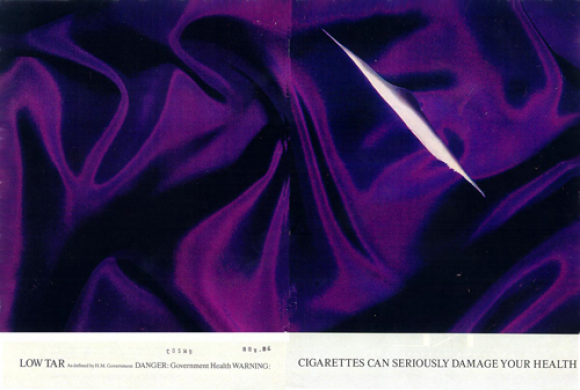 The escalation of anti-smoking hysteria since the 1964 report of the Surgeon General's Advisory Committee on Smoking and Health is due to the failure of devastating facts to significantly impact people's behavior. Whether in a subtractive manner, as with the ominously Stalinist purging of cigarettes from the Jackson Pollock and Robert Johnson stamps and the overnight disappearance of the cigar from the mouth of one of the Pep Boys, or in the more proactive media saturation of anti-smoking messages, the official picture is characterized by a nightmarish lack of rational proportion. The government's recent shift from relatively straightforward attempts to ensure the dissemination of scientific findings related to smoking's health risks to the cooption of juvenile Adbuster-style billboard modifications is a dynamic of desperate measures. While an inspired exercise in classic detournement, the conspicuous "I Miss My Lung, Bob" billboard campaign (the design and rental of which is paid for by the tobacco companies themselves as part of a landmark 1998 $206-billion settlement between major tobacco companies and forty-six states) appeals to the same cringing puritan peer-mediated self-consciousness that fuels the very brand-preference solicitations it is meant to redress. Such selectively sanctioned culture-jamming renders the anti-smoking campaign a mere propaganda tool for a rival corporate agenda. As each notched-up assault fails to get the desired response, the tactics of persuasion increasingly reflect the conviction that individual citizens are incapable of making up their own minds: Given every opportunity, they continue to make the wrong choice. If people enjoy smoking in full knowledge of the possibility of disease and death, we must threaten them with social ostracism or publicly humiliate them as sexually inadequate. Accuse them of murdering tiny defenseless babies with "second¬hand smoke." It's for their own good. What many refuse to acknowledge is that people don't start to smoke cigarettes because tobacco companies convince them to do so with glamorous imagery. If they did, then it would be easy to make them stop smoking through the same kind of manipulative advertising, the addictive qualities of nicotine notwithstanding. The underlying assumption — that the populace is a herd of mindless sheep who can be persuaded to do what is deemed to be in their own or someone else's best interests — is false. All this hysteria, something of an operatic extravaganza in itself, relentlessly avoids a simple truth about the human condition, which artists have known for millennia and Freud spelled out almost a century ago. People want to die. Among a plethora of competing desires, people want to die, and the microtonal variations between being and nothingness make for a rich and potent aesthetic vocabulary. Even those who still can't stomach smoking as a form of mediated self-directed violence, like piercing, should be able to admit that at least some smokers are making an informed choice. As such, there must be a qualitative difference made to their lives by their relationship to cigarettes that outweighs the quantitative joys of a long, healthy employment history. A qualitative difference is an aesthetic difference, and the witchhunt against cigarette smoking is in my opinion essentially a campaign of aesthetic censorship based on a lopsided and superficial understanding of human nature, combined with an increasingly self-righteous policing of individual creativity in American culture. Tobacco, and particularly the cigarette, has had a deep influence on the structure and content of American culture. The colony at Jamestown would not have survived if John "Mr. Pocahontas" Rolfe had not planted the first tobacco cash crop in 1612. Soon enough, King James I -- who in 1604 had decried tobacco for causing "a generall slug-gishnesse, which makes us wallow in all sorts of idle delights" -- was relying on Virginian tobacco for the British Government's largest source of taxation revenue. For a time, the tobacco leaf itself was legal tender in Virginia and Maryland. Apart from its centrality to the social and economic self-invention of the nation, though, tobacco had to wait for James Duke and the steam-driven Bonsak machine's industrial mechanization of cigarette manufacture and the concurrent rise of mass media to make its most profound impact on American popular consciousness, an impact that would help shape not only the content but the very mechanics of the Western world's attention span as we have come to know it. Furthermore, cigarettes are responsible for an inordinate amount of strikingly creative fallout, if only indirectly. Witness phenomena as high profile as Philip Morris's ongoing sponsorship of contemporary art exhibitions and as lowbrow as the vast and labyrinthine subculture of the baseball card. Beginning as early as 1887 with Allen & Ginter's World Champions set but truly popularized with the White Border Company's T-206 series of 1909, the base¬ball card performed the dual function of providing a collectible premium and a physical reinforcement for the cigarette package. Ladies were simultaneously courted with trading-card-sized lithographs on silk, reproducing everything from dog breeds to Old Master paintings that could be sewn into quilts. Even as idiosyncratic a phenomenon as the demented urban planning experiment of Venice, California owed its origins to cigarettes: Tobacco-heir Abbot Kinney's attempt - almost a century before Vegas's Venetian Casino, - to transpose a compressed pop sampler of European grandeur, including canals with gondoliers, into a decadent west-coast tourist Mecca was paid for with the dividends from Sweet Caporal sales. Cigarette advertising alone has generated an overwhelming amount of fascinating aesthetic material, particularly the ugly, obscene, and wildly successful Joe Camel campaign. The "martyrdom" of this penile-shaped mascot — singled out for much of the anti-cigarette vitriol of the nineteen nineties — has given him a peculiar cult longevity and provided surprisingly sympathetic material for Michael Moore and the revived Firesign Theatre. "However, is it not a pretty dandyism to give one's life to a cruel, inextinguishable, and completely useless desire?" The cigarette's widest and deepest symbolic impact on art, of course, has been through the cinema. Its history contains a phantom story that delineates the evolution of the choreography of cigarette handling, the mysterious calligraphy of the glowing red ember dragging in the darkness, the social acrobatics of sharing and occupying space or of using one's mastery over the small white totem to generate and enhance the postural remove at the heart of filmic glamour — all of which became templates for conduct in everyday twentieth-century urban life. These examples are credible evidence for the cigarette's import as a cultural icon, but when I began thinking on these things, and asked my friends who have smoked for their input, a deeper stratum emerged. The experiences of those who had quit— post-withdrawal reports of sensations of anchorlessness, overwhelmment by the monolithic magnitude of smoke-free reality, and a temporal orientation fundamentally corrupted—suggests that cigarettes serve a primary structural function in the way all Americans perceive reality. For the user, waking reality is paced and punctuated by the cigarette in an ongoing mutual mimicry of its own representation. The cigarette carves and frames experience with innumerable small, perfectly orchestrated rituals marked by the sacrificial burning of sacred herb, the absorption and alchemical taming of fire into the body, and the elegantly scripted immolation of the phallic totem. And while there are other avenues to similar modes of temporal reflexivity, and smokers are more profoundly affected by dint of their direct physical engagement, nobody in our culture is untouched by a second-hand phenomenological shift. So, cigarettes are structural units of a deep language, defining discrete parcels of experience as consumable artifacts, establishing a parallel time stream from which the resulting narrative sequence of life may be observed. Addiction imposes a rhythm, an oscillation between sacred and mundane realities, a pulse that flattens the heretofore undifferentiated parcels of phenomena into aesthetic, contemplative units. It's no wonder that tobacco and standardized timekeeping were introduced to the West within a few years of one another, around the middle of the seventeenth century. With its coming-of-age through mass production after the industrial revolution, the cigarette began to open a contrary model of time — a contained fictional dynamic that undermines the monolithic measured simultaneity of Greenwich Standard Reality. Through its iconic presence in popular culture and its omnipresent structural predominance in everyday life, the cigarette has permeated the very fabric of contemporary experience. It remains inextricably interwoven in an evolving dialectical pas de deux with its own representation. The sudden removal of cigarettes will affect the public's perception of time, the purposeful structure of social gathering, and the ability to perceive and therefore manipulate experience from an aesthetic remove. Taming death opens a window, allowing us to see life as a series of artistic choices. Nail the window shut, and it only serves to increase the cabin pressure. The demonization of cigarettes will, in the long run, serve only to recharge the object and activity with bohemian noir juice, reinscribing a secret landscape of stoops, alcoves, and stairwells superimposed on the secular one of sanctioned public spaces and resulting in a clandestine omerta of glances and signals beneath the banalities of watercooler chitchat: a license to kill folded discreetly behind your social security card and VISA.